Play the Rugby Star slot game at Slot UK for free and for real! 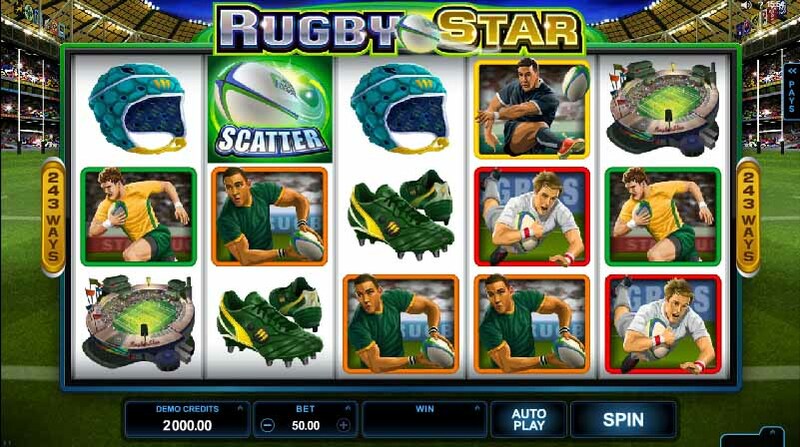 Microgaming combined a slot machine with Rugby to create a game called Rugby Star. It is based on the Rugby World Cup of 2015. The background viewed while playing the game is a rugby field and the symbols used are players from all over the world. The player symbols represent New Zealand, England, Australia and South Africa. The themed symbols are a pair of boots, a helmet, and two players tackling each other, the World Cup and a Rugby stadium. The game’s wild symbol is represented by Rugby Star’s logo and its scatter symbol is a rugby ball. Stacked wilds are featured in this game and there are over 40 wild symbols that appear on the reels. The stacked wilds will only ever appear on the third, fourth and fifth reels on the game screen. The appearance of at least three of the scatter symbol on the reels after a single spin triggers free spins. 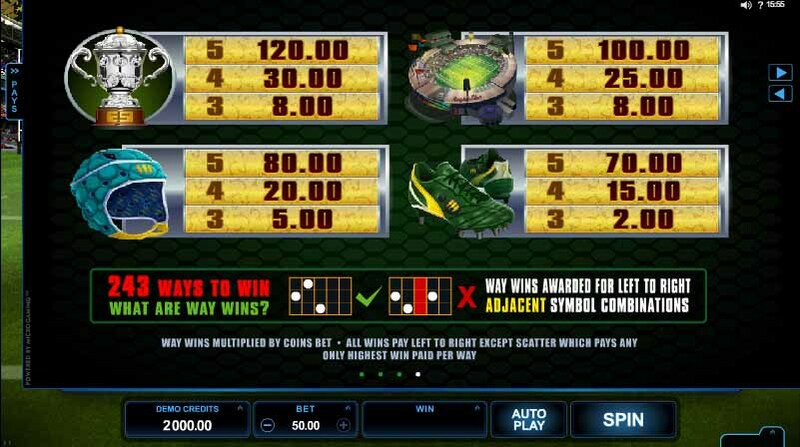 When players get three of the scatter symbols on the reels they get 15 spins for free, while four of the scatter symbol gets them 20 free spins and five of the scatter symbol gets them 25 free spins. Rolling reels come into play during the free spins round. Though it is impossible to retrigger more free spins during this feature, the number of winning spins a player gets effects the value of the multiplier they get, with the largest one increasing their winnings 10 times over. This is not the only bonus feature built into the game. Rugby Star also has a Wild Pass bonus round. This bonus is randomly triggered during regular gameplay. One or two reels will become wild reels when this happens. Players are guaranteed to complete the Wild Pass bonus round with winnings. Though Rugby Star is a simple game it is one that those who enjoy the sport will appreciate. Players often feel like they are immersed in a real life Rugby game with athletes that aren’t afraid to show off their skills and physical strength. Rugby Star appeals to players in countries where the sport is popular.